noms in estonia – tulen loobin su katusele kive! 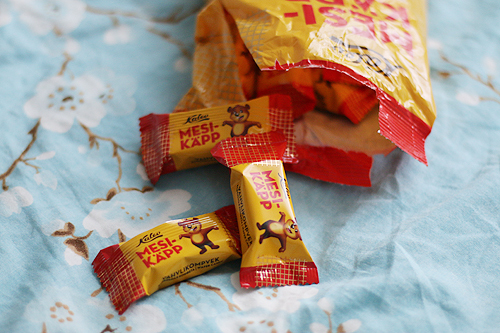 Mesikäpp, or Honeypaw in English, is a cutesy nickname for a bear. 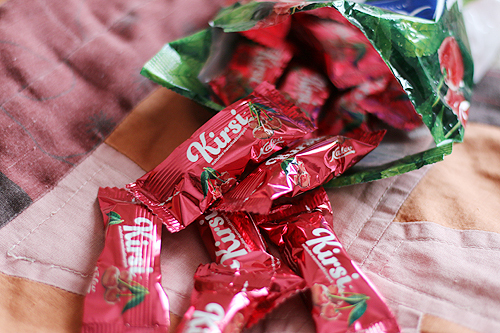 It’s a very old candy in Estonia. 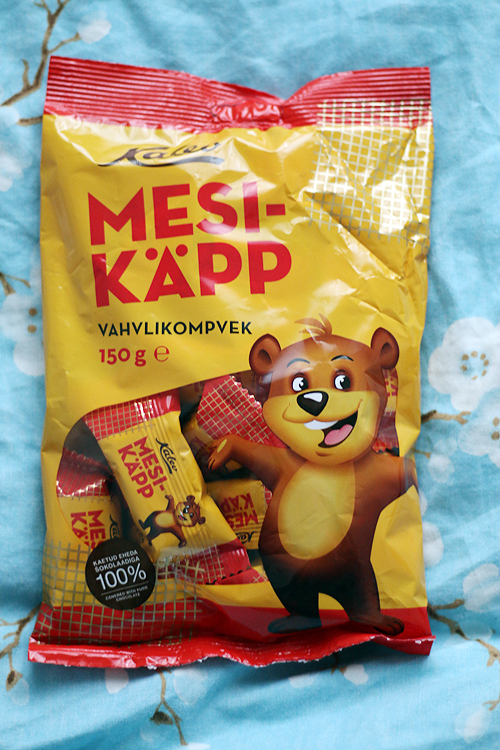 I remember it back from when I was still a tiny girl 😀 The packaging has changed several times over the years, but seems to have settled on this version of a cartoony bear nowadays. 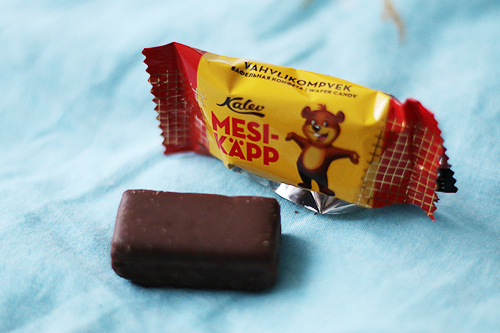 In fact, Kalev has turned “Mesikäpp” in to a general brand name, so several other products, for example cookies, ice-cream and chocolates, have made an appearance under the same name and advertised by the same “Mesikäpp” bear character. Ingredients: Sugar, wafer 17% (wheat flour, rapeseed oil, emulsifier (lecithin), salt, raising agent E500, egg powder, stabiliser E414), cocoa mass, almond, cocoa butter, vegetable fats (palm, Shea kernel), emulsifier (lecithin), flavouring, vanillin. Chocolate 40% min. Preservative free. May contain traces of nuts, peanuts, milk products and sesame seeds. Even though this is supposedly an old flavour and I know I ate this candy as a child, but I don’t really have any memories of the taste with this one, so I can’t really tell if the taste has changed over the years or not. Doesn’t matter I suppose. 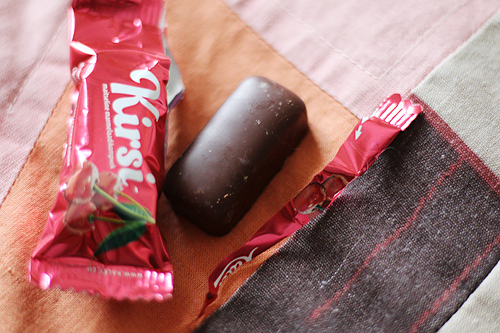 It’s a crunchy wafer candy with sweet creamy filling between the wafers and everything coated in dark chocolate. On their product page they claim that the praline filling is supposed to be almond and hazelnut flavoured (is that what praline means? xD), but to me it mostly just tastes like something sweet. 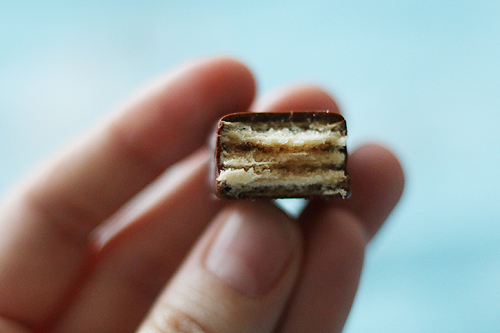 I can’t particularly taste the nuttiness, but I like how the dark chocolate cover and the wafers balance out the quite sweet filling of the candy. I also like that the softness and the crunchiness of the candy is nicely in balance. 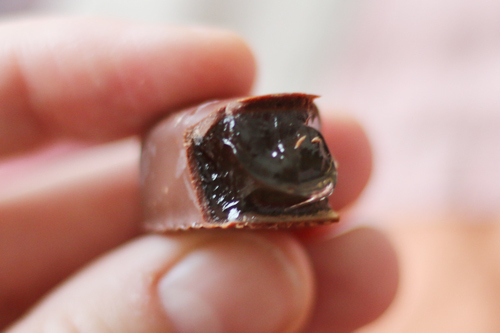 The candy is neither too mushy nor is the wafer too hard. 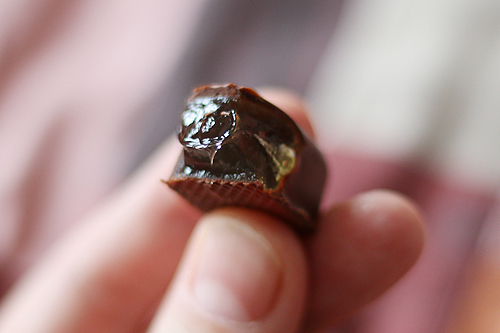 It’s a nice crunchy treat to have with coffee for sure. 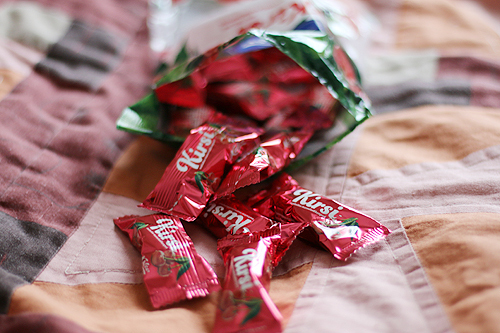 Will I buy/eat this candy again: I’m pretty sure I will. 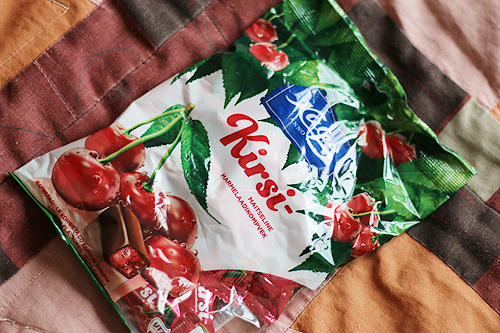 Would I recommend this candy to others: It’s a simple traditional Estonian candy flavour, so yes, I think it would be a good thing to try if you are into wafer candies.